Tom Light, Sr. was born into the jewelry business in 1946 in Plattsburgh, New York near the Canadian border. His father Andre was as a watchmaker and bench jeweler in a small local jewelry store for almost two decades. Then in 1961, when Tom was a sophomore in high school, Andre opened Lights Jewelers, and Tom began working there after school and on weekends. He continued working there while attending college, where he received his B.S. in Biology. Even when Tom became a biology teacher at his old high school, he continued working in his parent’s jewelry store because it was open until 9pm. In 1973, Tom felt the call to become a jeweler with his dad, so he quit teaching and began working full-time at the store. His ever-curious mind led him to study gemology at the Gemological Institute of America. On July 23, 1974, after passing a rigorous 6-hour gem identification test (which he had to pass with a perfect 100% score), he received his Gemologist degree from G.I.A.. Then Tom applied for membership to the prestigious American Gem Society where, after more study and testing, he simultaneously attained the title of Registered Jeweler and Certified Gemologist. In 1981, Tom was honored to be one of only 150 gemologists in North America invited to Denver, CO to test for the first Certified Gemologist Appraiser exam. Only 51 jewelers passed. In 1999, Tom, and his wife Susan, moved to Hattiesburg, Mississippi to open Lights Jewelers & Gemologists. Since then, they have been appraising, selling, buying, designing and producing quality jewelry to the Pine Belt - and happy customers from several other states. Tom has to complete an annual test to maintain his American Gem Society C.G.A. certification, and he is honored to have the only American Gem Society jewelry store in the Pine Belt. Like Tom, I was also born into the retail jewelry business. My dad and his were actually competitors in our hometown of Plattsburgh, New York until my dad retired. When I was in high school I worked in my dad’s store during the summers. I loved it because I got to wear beautiful jewelry and it was fun to help happy people find the perfect gifts for their loved-ones. I learned about jewelry by listening to my dad and his sales team. When I was 12, I met Tom at a church youth group meeting. It was love at first sight. We married very young and I wouldn't change that for anything. It was magical then, and we’re still having fun every day. In 1991 all of our children got married within eight months and moved away to pursue their dreams. Then the grandchildren began to arrive. We have seven now, and one great-grandson. They are the light of our lives. In 1999 we decided to open our own store in a place we had been visiting since 1981 - Hattiesburg. That has been the best decision of our lives. Our first little store was on Weathersby Road. But as our clientele grew, we knew our store must match their expectations. So we moved to Newpointe in 2008, tripling the size of our store and adding over 50 designers from all over the world. We're currently enjoying a gradual re-design of our store, which we hope you will follow on this website as well as our social media sites. We have some very creative artists and designers on our staff. Speaking of staff, the best benefit to come from our unexpected return from retirement last year has been the cultivation of a fabulous new team - some pretty wonderful people who make it a joy to go to work. This includes our dedicated artisan jeweler Roberto who has been with us for many years and become like a son for his kindness and support. For these wonderful people, I shall be eternally grateful. Come and meet them soon. I know you'll agree that we have the most competent, compassionate jewelry team in the Pine Belt! Roberto has been working in the jewelry industry for 23 years. He began working as a jewelry apprentice in 1995, and then opened his own business in 1997. He owned and operated Goldstone Jewelers for 5 years, and then he went on the road to work with a restyle jewelry company. He worked on the road for 12 years, traveling and visiting all parts of the United States. He spent valuable time gaining experience in jewelry making, design, and manufacturing. He joined the Lights Jewelers & Gemologists family on September 12, 2011 and has been here ever since. Roberto studied gemology with the Gemological Institute of America, and received his Graduate Gemologist diploma in 2016. He will become an American Gem Society Registered Jeweler and Certified Gemologist in 2018. Roberto married his wife, Christy, and together they have two children, Carlos, and Amelia. 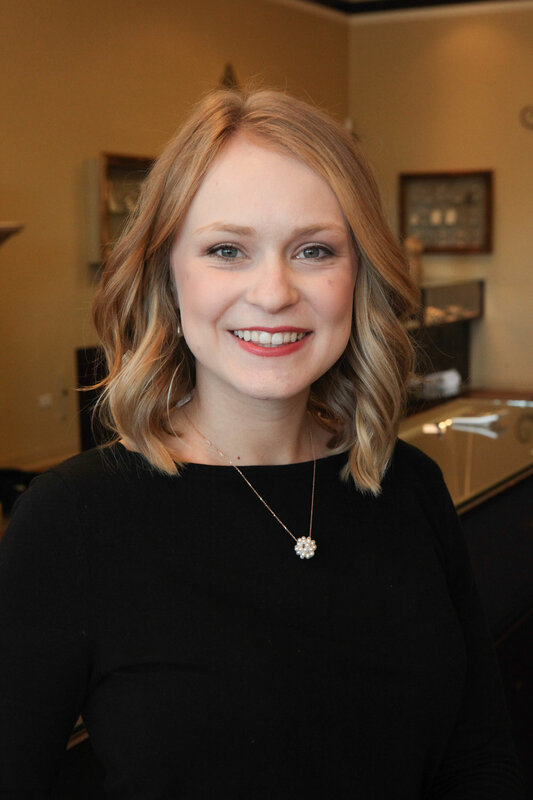 Lauren is a Hattiesburg, Mississippi native, who has worked at Lights Jewelers & Gemologists for a year and a half. In total, she has been in the jewelry industry for 3 and a half years. Lauren loves working for Lights because she has a big passion for jewelry. She loves getting to know the customers and getting to help them pick out the perfect gift for their loved ones. Lauren is happily married to her husband Travis, and together they have a son, Julien. Casey is a graduate from The University of Southern Mississippi where she received a BSBA in Marketing and a minor in Tourism Management. Casey is the Digital Marketing Coordinator for Lights Jewelers and she is currently in the process of receiving her American Gem Society Graduate Sales Associate certification. She loves working for Lights because the team is like a family. Her favorite part about selling jewelry is helping customers pick out engagement rings because she loves helping them pick out such a special piece. Casey is newly married to her wonderful husband, Josh. Melanie previously worked at Lights Jewelers a few years back and has joined the team once again. She enjoys meeting and working with customers to find their perfect piece in all price ranges. She enjoys working mostly because her coworkers work as a family and has an incredible boss, Tom Light Sr. She is the mother of 3 children and is married to Scotch Phillips. Sonya is originally from Laurel, MS, but has lived in Hattiesburg, MS since 1984. She is a former Dental Hygienist with a BS degree from UMMC and alternate route teaching degree from WCU. She has always had a love for fine jewelry and enjoys helping customers pick out pieces of jewelry to add to their collection. Sonya is the mother of two grown daughters. Brielle is from Ocean Springs, MS. She is currently a student at The University of Southern Mississippi where she will graduate in May 2018 with her Bachelor of Science in Nursing. Brielle has worked in the retail industry for several years throughout high school and college and has grown fond of the industry. Her favorite part about working at Lights is working with customers and helping them find jewelry that they love. Brielle is a dog lover, and is a proud owner of her Corgi, Gizmo.